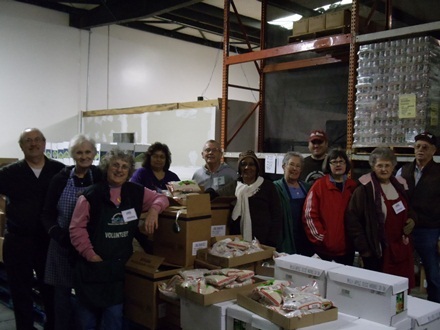 Senior Volunteers packing boxes at the Madera Communioty Food Bank. Back row from left: Ryan McWherter; Director, Michelle Ruiz; Office Manager, Michael Lipira; Warehouse, Steven Ward; Warehouse, Greg Ward; Warehouse. Front row from left: Zenia Brezindine; Office assistant, Maria Lopez; Office assistant, Joe Ramon; Warehouse, Sylvestre Conde; Warehouse. What kinds of products or produce do you distribute? We distribute any and all types of food products. Who is the target audience for your Business? We have no set target, we distribute to everyone who has food needs or is a Non-Profit capable of serving those in need. Are you part of a family owned business? No, however we have many families who volunteer their time here as well as our own families. What kind of discounts do you offer your customers? Any special monthly or yearly events? We are a Food Bank, so the Majority of the items are FREE. We also provide a Christmas and Thanksgiving Food Box when and if we have products available. What changes would you like to see happen in Madera that would help benefit your business and/or the community? We would like to see more communication between those who provide food to those in need within the Community. If we all work together, we can become more productive and provide a better service to those in need. What kind of community projects does your company participate in? We do community outreach at Health Fairs, Churches, and by providing food to those in need within Madera County. We distribute to Chowchilla, Madera, North Fork, Coarsegold, Raymond, and the Ranchos. We also participate in the Homeless Coalition and we are looking for further projects to join. Essentially our entire business is Community Outreach. Where would you like to position your company in the next 5 to 10 years? The goal of any food bank is to not be needed, however this is not realistic. We would like to see ourselves moved into a bigger warehouse and servicing our community in more areas with additional programs.